Does the Silencio Live Up to Its Eerie, Culty Hype? 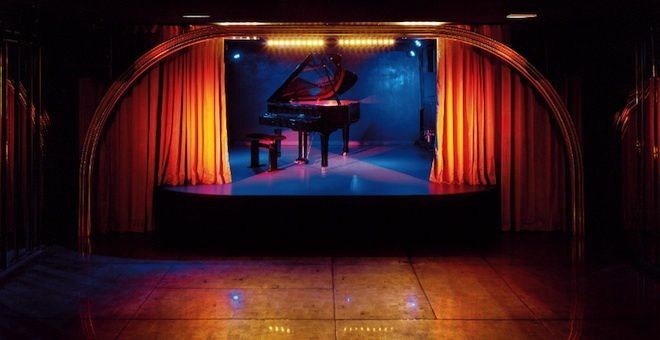 When cult filmmaker David Lynch opened a semi-private club for artists and performers in Paris' Grands Boulevards district, naming it Silencio after the eponymous and eerie club in his film Mulholland Drive, it instantly generated incredible buzz. Would it be as weird and creepy as Lynch's films? Would any mere mortals manage to pass its threshold, and if so, would they return unscathed? Or was it all an overhyped spot designed to make non-celebrities or billionaires feel unwelcome? We spent an evening at the steeped-in-mystery Silencio to find out what all the fuss was about. An Actual Social Club in 2012? These days, the term "social club" tends to conjure up the image of a clientele that consists of older men lurking behind corners as young socialites dance to popular DJs in a sweat-filled basement. Walking down the six expansive staircases to Silencio, you'd be forgiven for expecting to find just that. Entering into a dimly-lit alcove with a gold-lacquered ceiling, however, we found a mixture of both young and elderly artistic types waiting in an orderly fashion to check in their coats. And after wandering through a series of carefully-designed meeting and entertainment spaces, it seems safe to claim that a classic salon of 1920's Paris has successfully been recreated, though with a mid-century modern spin. Once serving as a resistance publishing house that produced works by the likes of Emile Zola, the building that now holds the club retains the same goal; a meeting place for the creative minds where ideas can be exchanged freely. In order to accomplish this, club owners wanted someone with not only an artistic mindset, but background as well to create a more modernized setting. Enter American director David Lynch, whose film Mulholland Drive served as the inspiration for Silencio. Lynch personally designed everything from the mirrored-forest smoking room to the shared bathroom sink, with the idea that guests can continue their conversations inside the facility, without interruption. After checking in our coats, we entered into a crowded bar area where three busy bartenders (who looked like artists themselves) shook elaborate cocktails exclusively created for the club. To the left, a library-styled lounge offers leather booths and stacks of art books. Many of the seats, however, were reserved in advance, reminding the clientele that even though this is a social club where communication is encouraged, a hierarchy still exists. Members are also treated to private concerts that start around 10:30 pm. Tables and chairs with a throwback Parisian cabaret feel are set in front of the stage as the band performs. An incredible sound system has been put it in place, allowing each performance (whether rock, classical or jazz) to rival those set in larger venues. Traversing a maze of underground alcoves, visitors uncover a black door that leads to perhaps the most impressive aspect of the space--the movie theatre. Visiting during the run-up to the presidential election in France, the theatre showed a line-up of popular political movies. As "Mr. Smith Goes to Washington" played on the large screen, visitors sat on grey leather couches that were dimly lit by the same gold color featured throughout the space. Silencio is a members-only club from 6:00 pm until midnight, after which the general public is finally allowed in and the place transforms into a nightclub. The cafe tables and chairs in front of the stage are removed before midnight, so that the space can serve as a dance floor once the "pleb" hour hits. There was definitely a quick exodus of members at this time, as a younger clientele entered ready to dance. Maybe it was because it was a Wednesday, but after looking forward to dancing all night, we were dismayed to find that only a laptop, already queued up with music, was the only thing that stood behind the DJ booth. The music also mostly consisted, disappointingly, of remixed disco songs: not ideal for anyone serious about getting their groove on. The Silencio club is members-only until midnight and programs for the month are available at check in. Open: Tuesday to Sunday from 6 pm to 6 am. Members only from 6 pm to midnight. Closed on Mondays. Becoming a member of Silencio not only requires a yearly fee ranging from an astounding €420-€1,500, depending on the package you desire, but also a review of your application form which asks you to explain not only your methods of creativity and your artistic achievements, but also your views on the best way to produce such achievements. On a rainy weeknight in April, however, there was no line after midnight to get in, which serves as a great opportunity to explore the club and determine if you want to splurge on a membership or just stick to the occasional outing. There are no photographs allowed or cell phone service available in the club, further solidifying its goal of keeping communication both inside and private. (Please note that the prices quoted here were accurate at the time of publication, but may change at any time).